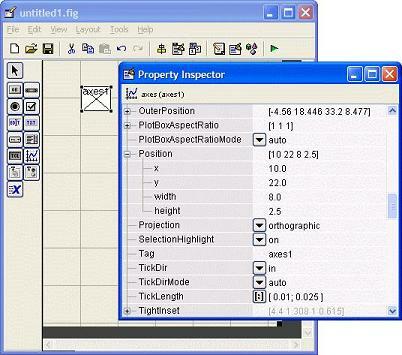 Matlab GUI - Magic Trick! 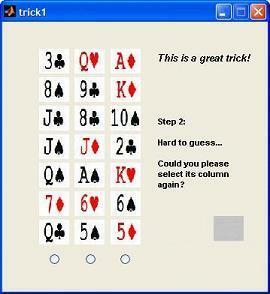 We are going to develop a Matlab GUI that performs a magic trick! We’re going to work on an interface to read your mind! Don’t be scared... it’s safe (as far as I know...). It’s an old trick that has been around for at least 40 years (maybe more), but this is my version with Matlab. I strongly suggest you read the first and second articles in this series, where I explain in detail how to create a Matlab GUI, and how to use the three most important instructions for GUIs (set, get and guidata). In this article, I’m going to elaborate on how to use the ‘axes’ and ‘radio’ buttons, as well as the associated callback-functions. First, type ‘guide’ on your command window. Select the default option (blank gui). You can see on the left several buttons that you can drag-and-drop onto your gui ‘canvas’ or layout area. Click once on ‘axes1’ and copy-paste (Ctl-C, Ctl-V) this element six more times (vertically). 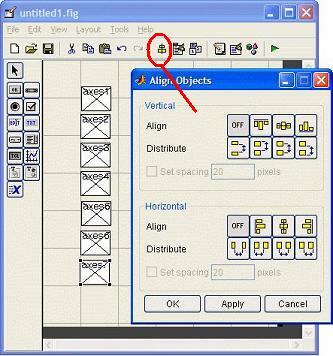 You can align the objects by clicking on the ‘Align Objects’ icon, on the top menu. You have 22 ‘axes’, 3 ‘Static boxes’, 3 ‘Radio buttons’, and 1 ‘Push button’, right? You can modify their sizes by dragging the ‘anchors’ on the corners. For the 3 ‘Radio buttons’, just erase their ‘String’ property and reduce their sizes to fit each column. Save the Matlab GUI (I used the name ‘trick1.fig’), and Matlab will produce a template for your figure (named ‘trick1.m’), with appropriate names and comments or suggestions to get the values of the elements on it. 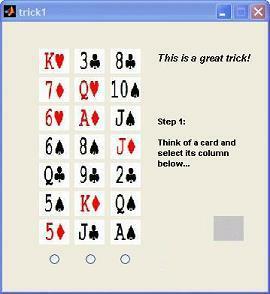 This is the implementation of the function named ‘initialize_trick.m’. These names are going to be associated with a jpg file. 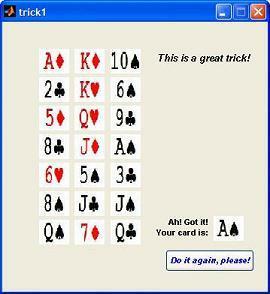 This is the implementation of the function named ‘showcards.m’. Here we actually associate a jpg file (a card) with its corresponding place on the matrix. We show a plain gray image on the ‘axes22’ position. % Take one .jpg file for each 'axes' (21 cards to deal). .m’. It launches instructions on the ‘text2’ Static-box, according to the evolution of the trick. This is the implementation of the function named ‘go_on.m’. It’s executed each time the user clicks on a radio button to choose a column. After three clicks, the selection is revealed! % Display the cards in a new order. This is the implementation of the function named ‘rearrange.m’. It takes the three columns of cards, each time the column with the selected card is put in second place. The other two columns are irrelevant for this trick. This is the main wrapper (‘trick1.m’). I deleted some of the comments automatically written by the Matlab GUI -DE (Development Environment), to simplify the explanation. 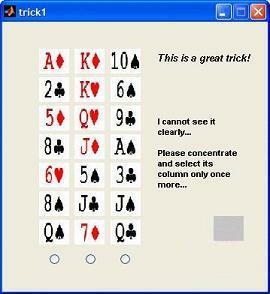 % --- Executes just before trick1 is made visible. % --Outputs from this function are returned to the command line. To run the program and see the Matlab GUI, save all these files with their respective names, put them into a single directory, go to that directory with Matlab and just type ‘trick1’ on your command window. Let's say that we choose the ace of spades, so we click on the right radio button.